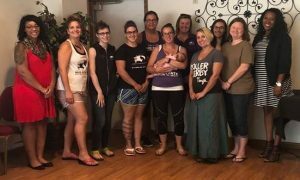 Community Support | The Women's Community, Inc. Here are some of the recent photos of donors and supporters of The Women’s Community. Thank you all for your support of The Women’s Community and the survivors we serve! 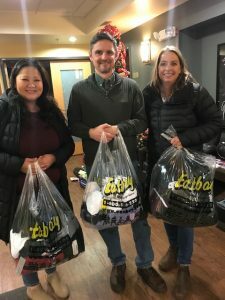 Eastbay donated clothing, total value of $700, for our advocates to offer victims of sexual assault whose clothing is taken as evidence when the victims present at the emergency room. Thank you Eastbay! 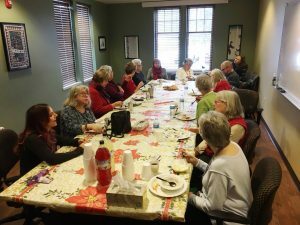 Volunteers at an appreciation luncheon we held. To all the volunteers who help keep this agency operating – THANK YOU!!! 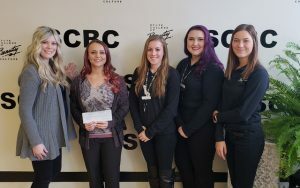 State College of Beauty Culture did a fundraiser for us, raising $560! Thank you State College of Beauty Culture! The Central WI Storm Members held a fundraiser at the Gobbler Cup and raised $320 for The Women’s Community. Thank you for giving back to your community and helping others in need! We wish you the best with your hockey season!! 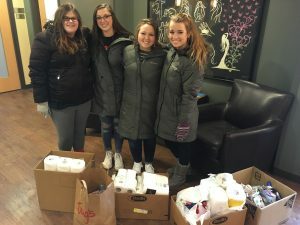 Thank you to the DECA Club from Wausau West High School for doing an incredible food drive! We have such an amazing community! Thank you to evolutions in design and Back When Cafe for your thoughtfulness and support! And to those who joined in this Gathering for a Cause, thank you! 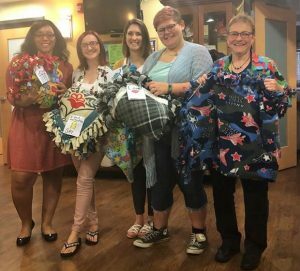 The entire proceeds from the dinner, with matching gifts from evolutions in design and Back When Cafe, were a charitable gift to The Women’s Community. 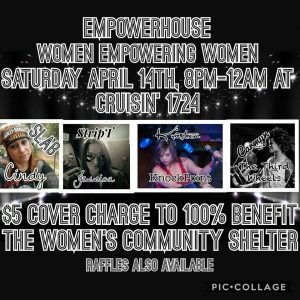 A big THANK YOU to Cruisin 1724 for don ating $7,082 from the EMPOWERHOUSE benefit. We are extremely grateful to be surrounded by a community that cares.Thank you to all who donated raffles, money, and time to make the benefit possible. It is because of generous people like you, that The Women’s Community celebrated 40 years this year! 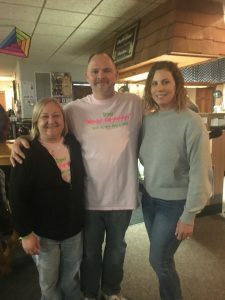 The 5th Annual “Dani’s Journey” fundraiser. 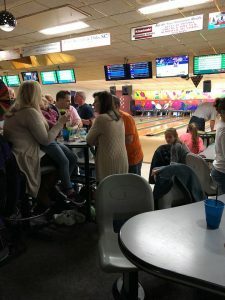 Dani’s family raised over $5,000 at the fundraiser for the Dani’s Journey Education Fund, through which TWC staff do outreach and educational programming about teen dating violence, healthy coping skills and AODA. 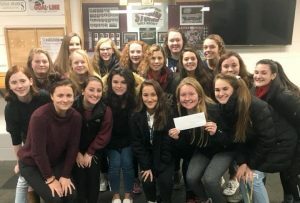 In 2017, Dani’s Journey Education Fund partnered with the Marathon County AOD Partnership and Mosinee Middle and High School to bring the group Rise Together to Mosinee Middle and High School. 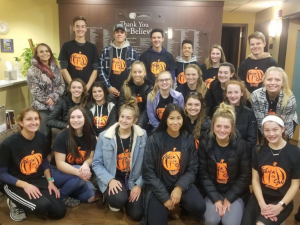 Middle and high school presentations focused on education, advocacy, and encouraged students to speak out on the issues they care most about; breaking the silence around suicide, bullying, mental illness, drugs & alcohol. A parent and public presentation with dinner and a movie screening was offered in the evening on the dangers of drugs and alcohol, understanding addiction, and providing resources to those in need of support in hopes the conversation will continue at home with parents. This program was funded by Dani’s Journey Education Fund. Other programming throughout the year included funding for a group called “My Choice” through John Muir Middle School addressing resiliency issues for 7th graders attending the group. 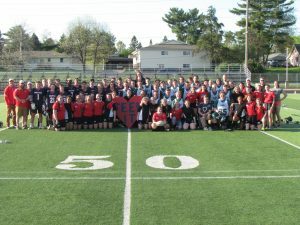 Thank you to The D.C. Everest Senior High Rugby and Lacrosse teams for their time and support in the Feel The Love Fundraiser! 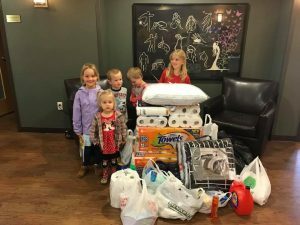 Thank you to the First Presbyterian Church and their “mini missions” for bringing items from our wish list. These little folks are learning how to help families feel safe and loved. 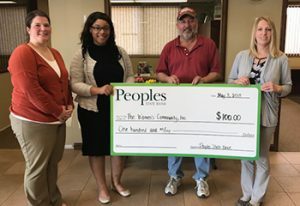 Thank you to Jon Handrick, a winner in People State Bank’s “Find Your Hidden Potential” contest! He selected The Women’s Community to receive a matching donation. 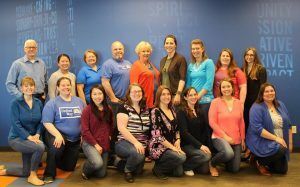 Thank you to the staff of the United Way of Marathon County for supporting denim day and bring awareness to sexual violence. 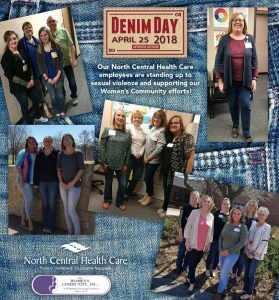 Thank you to the staff of North Central Health Care for supporting denim day and bring awareness to sexual violence. 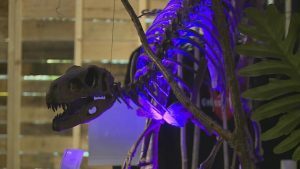 Thank you to Wausau’s very own science museum, Colossal Fossils, for running a special event to benefit The Women’s Community. Thank you to the Marathon High School Student Council for this donation. 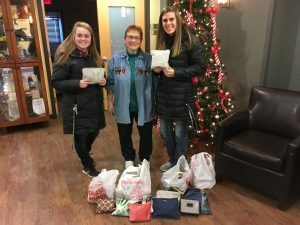 Thank you to the Mosinee High School sewing class students who donated hand-made personal care bags. 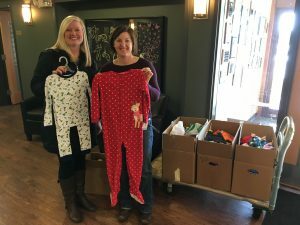 Thank you to the Pelican Elementary School of Rhinelander for this donation of pajamas. Thank you to Ollie, an 8th grade student that visited The Women’s Community on a school field trip. That was the moment she was encouraged to become a supporter. After learning to make blankets during a school project, Ollie wanted to use her new skill to do something greater. With the help of her parents and school teachers, Ollie was able to acquire enough fabric to make 10 blankets. 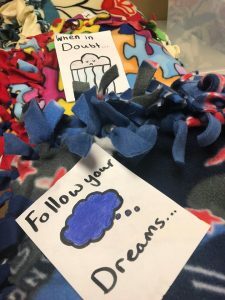 She spent 3 months making blankets for survivors, with encouraging messages clipped to them. 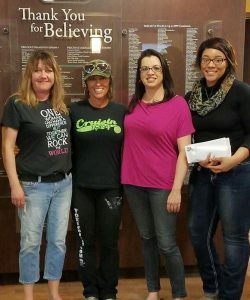 Thank you Mid-State Sisters of Skate for choosing us as the recipient for the funds raised at your Penny War Challenge at the Uff Da Palooza Roller Derby Tournament. We appreciate you thinking of us. 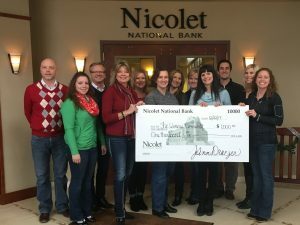 Thank you to the Nicolet National Bank Foundation for supporting TWC!